Opened in Beijing on December 22nd, 2016, the 10th National Exhibition of Chinese Gongbi Art displayed works of 44 contemporary artists who were recommended by members of an organization committee of the exhibition. 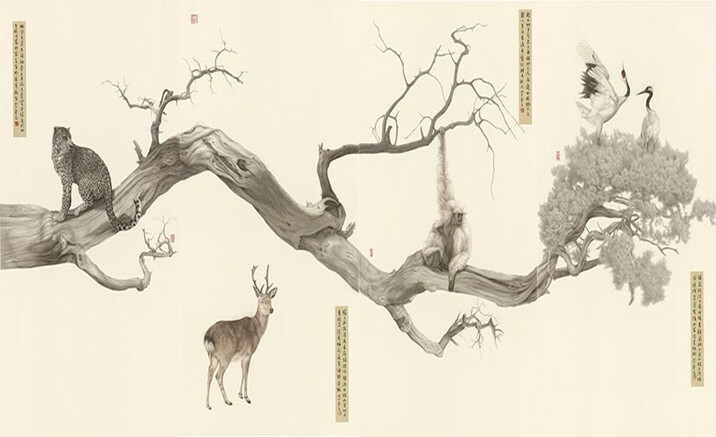 Those artists distinguish themselves by their styles of gongbi tradition (a traditional Chinese realistic painting) and experimental spirits. The exhibition challenged the limitation of gongbi as a meticulously detailing technique, and enriched the spirit of gongbi by introducing contemporary art approaches such as installation and video. It is more than an innovation of tools and materials. Moreover, it gives a new concept that blurs the technical boundary of gongbi. The triennial display is currently being held at the National Art Museum of China and will last until January 1st, 2017. Beijing-based China Gongbi Art Society initiated this exhibition as the best 30th anniversary present to the public.